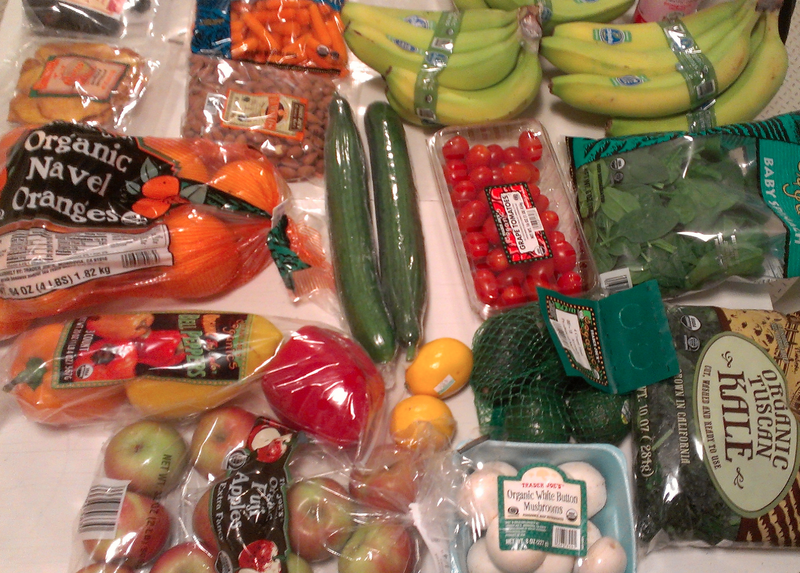 When you decide to start eating healthy, you have to tackle the monster of grocery shopping. It is daunting with all the fat-free, sugar-free, low-cal, and diet foods. Which vegetable do I pick? And how do I even use it? Well I’m here to help you out! First off, I’d like to say you can always email me from my contact page and I’ll give you free advice and answer your questions to my best ability. And if I don’t know the answer, I’ll research it and get back to you. My main goal is to be a helpful resource for weight loss, fitness, wellness, and overall health. Mind. Body. Soul. Now let’s tackle that shopping cart mess. 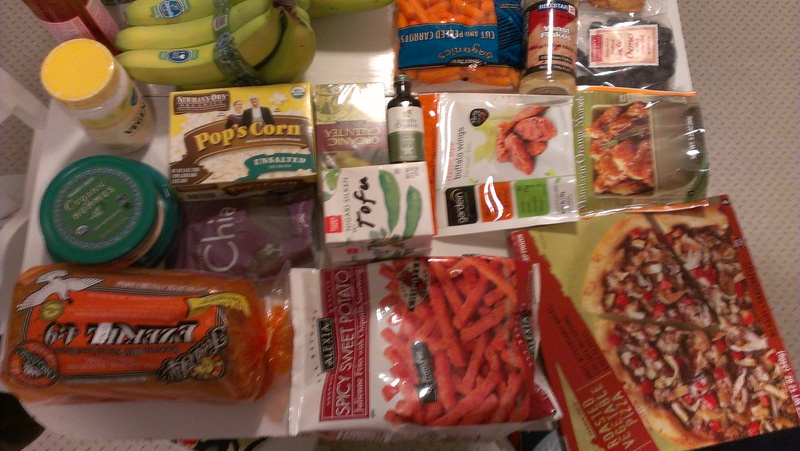 I’ll show you what my grocery shopping loot looked like today. Hint: I used the Thrive Forward Food Staples list as a guide. Don’t mind my blurry phone pic. I shop mostly at Trader Joe’s and go to my local health food store for my specialty items. I don’t have a local farmer’s market so I do the best I can with the budget I have. The list goes as follows, just in case you want to eat exactly what I’m eating haha. 3 Cartons Silk Unsweetened Non-Gmo Almond Milk (30/Calories/Cup) -I forgot my almond milk, which I buy from Wal-mart because it’s the cheapest there. And that’s the gist of it. This will last about two weeks for two people, except for the things like almonds, chia seeds, yeast, mayo, vanilla, and bread. Those will last up to a month or more. The produce will be gone and I’ll eat the frozen stuff and then go shopping again. Total cost was $123.12. 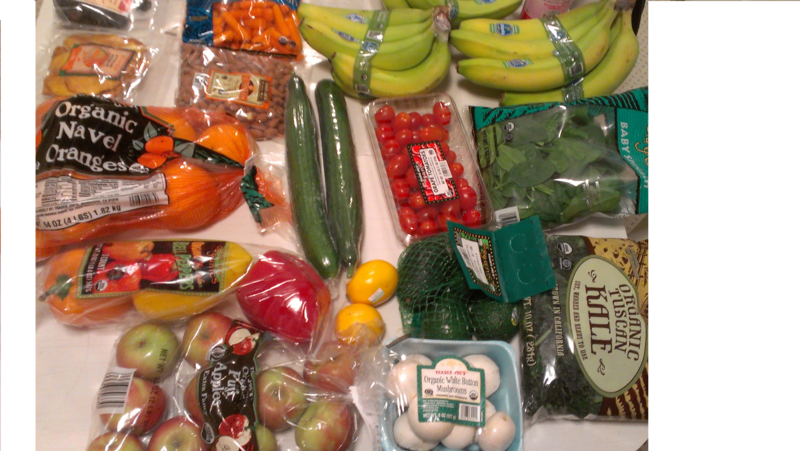 So averaging out to under $5/day of organic food for two people. Who says healthy is expensive? Not me! What Do You Make? I’ll make salads, scrambled tofu, dip the cucumbers in the hummus, snack on the tomatoes, carrots, almonds, and dried fruit. I’ll eat the apples and juice apples/oranges/spinach. I usually roast/grill my bell peppers and put them in a sandwich, wrap (still in the fridge from last shopping trip! ), or my salads. I also dip them in hummus. The mushrooms will be grilled up. And that’s about it. Most of my meals are smoothies, salads, sandwiches, wraps, or appetizer plates of raw veggies and hummus! And when I’m feeling junky, I go for the Roasted Veggie Pizza, but even that WHOLE pizza is 750 calories, with very little fat (good fats!). I’m simple. Once in a while I’ll make some crazy recipe, but most of the time I’ll fail at that. I like to just snack on raw veggies, make dinners in under 10 minutes, and use my time wisely on other things. . . like helping You. Not Shown Here; But I eat daily: For supplements I use Vega One, Vega Sport Protein, Pre-Performance Drink, Maca (starting tomorrow! ), and Orange Dreamsicle Super Greens. I try and drink a VegaOne shake each day, either mixed into my breakfast/dinner smoothie or as dessert before bed. It has all the vitamins, minerals, and probiotics to get your digestion going and your body feeling great. I have 3 flavors now but always stay stocked on at least one. I use the protein powder after my intense workouts that last over an hour, or just as a snack to feel full before a meal or going out to eat. I’m starting my Maca powder routine tomorrow, adding it into my smoothie. I drink a smoothie either for breakfast or dinner, depending on how I feel. I attempt to drink one serving of the Orange Dreamsicle greens (seriously this stuff tastes amazing for a wheatgrass/chlorella/etc. blend) every night, but don’t always make it. If it has a commercial, it’s probably not great for you. Have you seen any of these products in a commercial? No. They don’t need a commercial. You see them and know they are healthy. Kale doesn’t need a low-cal label. Oranges don’t need a “100% Vitamin C in Every Serving” ad. And bananas don’t need a big sign on them saying “great for smoothies and snacking.” They sell themselves, rightfully so. Thrive Forward: Now if this is all too much to read and you’re feeling really lazy. Just look at the pictures and watch this video.